"Hey, Tails! What are you doing here? Aside from being menaced, I mean?" Sonic the Hedgehog has been around for a long time. He's made the most of that time, weaving through one opponent and the next en route to saving his planet from any and all comers. That trend continues in Sonic Mega Drive #1 from Archie Comics. The issue is written by Ian Flynn, illustrated by Tyson Hesse, colored by Matt Herms and lettered by Jack Morelli. The nefarious Dr. Eggman is trying to build a new engine of destruction: the MEGADRIVE, and it’s up to Sonic and his whole crew to stop the mad doctor and save the day! It's clear that Flynn was a big fan of Sega in its heyday as Sonic Mega Drive #1 bears all the hallmarks of the series. 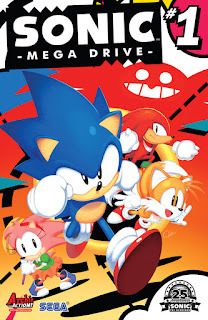 The issue reads much like an incarnation of the game, with Sonic making his way through different zones and picking up friends along the way in his quest to stop Dr. Robotnik. Flynn nails the relationships among the characters and his dialogue keep each character pretty true to form. Naming Dr. Robotnik's latest invention "Mega Drive" is also a wink and a nod to Sega's headier days and Flynn leans on its impending creation as the central plot point for the issue. The issue is paced very quickly and Flynn clearly enjoyed writing it, allowing the reader to enjoy it as they go. Presenting Sonic et al. in a way that harkens back to the 90s is Hesse whose line art is very simple yet effective in capturing the spirit of the characters. Many of the panels are pretty action-packed and Hesse illustrates the characters cleanly so the reader can keep up. Most of the pages feature non-traditional panel layouts that mimic the frenetic action happening to and around the characters. Each world in the issue is also distinct and gives the reader a sense that Mobius is a very diverse and large planet. Herms' colors are spot on in keeping with the traditional look of the characters as he relies on basic, primary colors for the entirety of the issue. Reading Sonic Mega Drive #1 offers a nostalgic throwback to playing the games on the Sega Genesis. Sonic has his work cut out for him and continues to go after Dr. Robotnik as he launches his latest nefarious plan for subverting the inhabitants of Mobius. Flynn's script is a loving homage to the 16-bit era when Sonic and Mario dueled for supremacy in living rooms, tapping into that nostalgia to pen a well-paced and entertaining story. Hesse's illustrations are almost reverent in their approach and pay plenty of respects to the world. Sonic Mega Drive #1 is a lot of fun and doesn't take itself too seriously--two traits that the main character prides himself on. Sonic Mega Drive #1 is in stores now.